My point was the steepness of the line. The slope measure the rate. The rate has never been so fast for any year when the ice pack hasn't been within the normal range. It's been that fast before, but when it was the pack was within the bounds of prior years averages. Now, that wouldn't mean much if there weren't a heat wave currently in effect. We might expect the line to suddenly wander toward the average. With the current conditions in place, though, it promises to open up more water before the sun is at apex for the year than has ever been open. That just means more heat absorbed by that water. Anything can happen. A storm system that cools things down could crop up, and stay in place for half of the summer. This doesn't mean all that much, except that if those aspects of randomness are eliminated we could see a new low. 5th April.... minus 30 k ... 8 k more than average .....starting to revert to mean ? I've always been of the opinion that going into summer solstice was the most important measurement of extent in the year. In April, the Bering Strait is already receiving more heat from the sun than it would in September because the days are longer. Of course my opinion has no effect on anybody and the Minimum extent hoopla will continue while folks ignore the more critical time period. Dark blue is ice free, light blue is slushy ice water mix and white is solid ice. Note how far below average for this date we already are just three weeks after solstice. GoghGoner wrote: I've always been of the opinion that going into summer solstice was the most important measurement of extent in the year. In April, the Bering Strait is already receiving more heat from the sun than it would in September because the days are longer. Of course my opinion has no effect on anybody and the Minimum extent hoopla will continue while folks ignore the more critical time period. For one reason alone I am more concerned about early loss in the Barents vs the Bering sea's. Simply put the water exchange through the Bering strait is quite limited so even is the Bering Sea gets relatively very warm little of that water will intrude into the Arctic Ocean Basin. The Barents sea on the other hand is the broad entry to the Arctic Ocean and when that surface water gets warm it can erode surface ice further north very quickly if the currents drive it in that direction. Someone is trying to recreate the utility of the old University of Colorado Arctic Sea Ice (Cryosphere Today) website. Looking through the satellite images of Nares Strait and, wow, this is incredible to me -- that ice is flowing right through in April. It used to be that the arch would hold the entire summer! The whole area from Spitsbergen up to 85 degrees NL, East to https://en.wikipedia.org/wiki/Severnaya_Zemlya is in a very bad sea ice shape. If we lose that last barrier of cold and ice the heat on the ESAS will be turned on, Eurasian/Northafrican waterdamp and heat might make it to the Brooks range, colliding with the pacific moisture going North.....well, that is a long shot, at least 2000 miles. Anyway, Nova Zembla is the door and it is wide open now. Snowcover of Russia, the Eurasian part must be very low after an extremely warm winter and early spring, that will dump extra heat on the shores of the Kara and Barentz sea, maybe even the Laptev sea but temperatures have been around normal, arctic this winter. Last edited by Whitefang on Tue 09 Apr 2019, 12:19:25, edited 1 time in total. 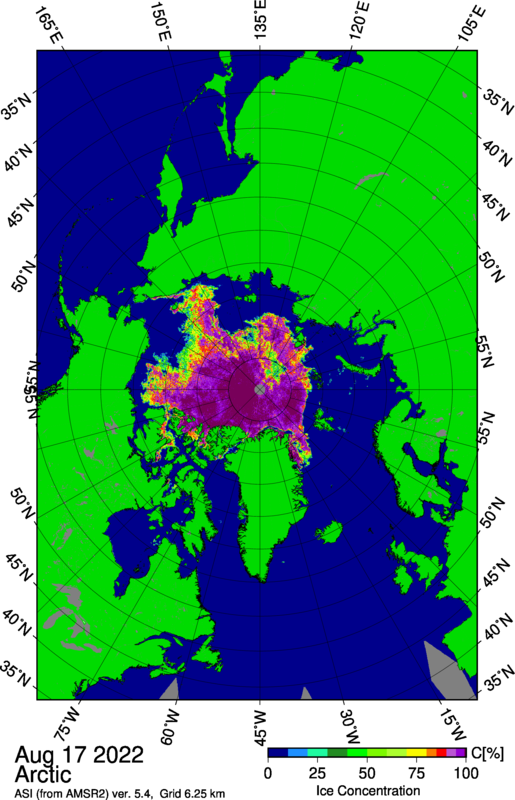 How long has 15% sea ice cover been the standard for determining extent? Someone explain to me how 85% open ocean can be considered ice? jupiters_release wrote: How long has 15% sea ice cover been the standard for determining extent? There was this thing called the Titanic that hit an ice one percenter that illustrates the problem. So far as I can determine 15% has been the standard since 1979. The big difference is between calculating 'extent' vs. 'area'. When doing Extent everywhere with 15% plus is counted as 100% ice, when doing Area they actually subtract out the ice free area from the Extent to give just the area actually under ice cover. Dave Borlace with JHAT, just have a think YouTube video. collapse of the Greenland Ice Sheet. Paul on the arctic, very interesting weather lately on the USA, this is going to be an interesting year climate wise. Not good at all…….that sums it up. I was just watching Beckwith's video from last week covering ice volume, graphs we've seen countless times. I remember how alarmed we were back in 2007/2008 when the volume really deviated almost 30% from the normal exponential decline trend in peak summertime lows. If you separated the graph pre-2007 and post-2007, the decline trend post-2007 has a much softer decline rate. Someone should in fact do that because from my simple visualization it appears the blue ocean event could in fact be couple decades away still excluding unknown feedbacks that could hit when new lows are reached. The 'new' trend post-2007 means the scaled implementation of geoengineering has been working. This isn't anything to celebrate though as the undisclosed tonnage of solar reflecting nano aluminum aerosols being injected into the stratosphere every week is highly toxic to life and most likely responsible for much of the ozone destruction. McPherson's timeline might not be that wrong though because what we're doing to fight global warming isn't sustainable. How much UVC can life endure? The sun is one giant germicidal lamp without the ozone! You'll have to excuse my previous post, I hadn't had my morning green tea yet. The ESAS methane obviously will prevent blue ocean extending that long out barring nuclear winter armageddon or a big volcano. But as the data shows we would've had blue ocean last year or this year if it weren't for geoengineering! Amazing to understand our true position, very few people outside the highest level policy makers do. Quite unfortunate they're using aluminum instead of sulfur dioxide though. "Researchers Warn Arctic Has Entered 'Unprecedented State' That Threatens Global Climate Stability"
Alaska is a small part of the Arctic, most of it is outside of the Arctic circle, same for the Bering sea, not sure this is indicative of the entire Arctic where there remains a lot of ice, check temperatures at our old friend Resolute Bay for example. Arctic sea ice extent for March averaged 14.55 million square kilometers (5.62 million square miles), tying with 2011 for the seventh lowest extent in the 40-year satellite record.